Defenceman Ben Russell was man-of-the-match for Phantoms in Telford. Peterborough Phantoms were left to reflect on a nightmare second period as they crashed to a first defeat of their English Premier League play-off campaign. The city men were thumped 7-0 at title-winners Telford tonight (March 25) with all of the damage being done in a disastrous middle session. Disappointed Phantoms coach Slava Koulikov. The seven goals arrived in a spell of just under 16 minutes between a Corey McEwen opener at 23:47 and a Jason Weaver powerplay effort at 39:39. Rick Plant doubled the hosts advantage before Doug Clarkson struck on a powerplay. Plant and Weaver then netted just eight seconds apart before two further goals arrived in the space of 24 seconds during the final minute of the period. Clarkson got the first of them before Weaver completed the scoring. 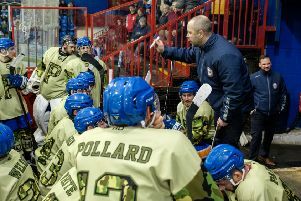 Phantoms coach Slava Koulikov admitted: “The first and third periods were fine, but the second was not one I want to remember. “The goaltending wasn’t very good, the refereeing was questionable at times and we collapsed for a spell of the game. “We conceded a weak goal, and we lost our discipline and shape while having to kill a lot of penalties. It happened against a team who have the quality to punish us and they carried on doing that. “I didn’t need to say much to the guys after that. I just told them to ensure they played better in the final period and they did. “It doesn’t matter whether the scoreline is 1-0 or 7-0, it still goes down as a loss on our record. Phantoms are back on the ice tonight (March 26) when they welcome group leaders Guildford to Planet Ice (5.30pm) with Koulikov calling for a ’60-minute performance’. The Flames have won both outings so far after following up a midweek 3-0 triumph in Telford with a 3-2 success against Sheffield. Phantoms had slammed Sheffield 12-0 in midweek.